Apple is a "buy the dips" stock this fall -- and we just got a dip. It finally feels like the dust is settling following last week's sharp correction. While volatility remains elevated, this looks like a pretty textbook example of a bull market correction rather than a crash. One nice side-effect of corrections is that they provide buying opportunities - and, not surprisingly, that means we're starting to see some attractive price action in some of Wall Street's biggest stocks. 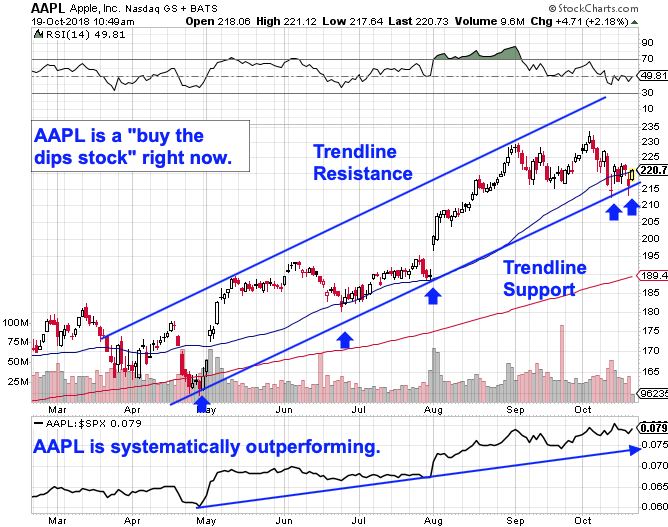 Case in point: Apple Inc. (AAPL - Get Report) . To figure out how to trade it from here, we're turning to the charts for a technical look. Like many of the stocks that are "working" in this market, you don't need to be a trading expert to figure out Apple's over-arching trend in 2018. This big stock has been moving up and to the right in the intermediate-term. More importantly, that bullish trajectory has been contained by a well-defined uptrending channel, a price range that's identified the high-probability zone for Apple to remain trading within. That price channel gives us a pretty clear expectation for what Apple is most likely to do this fall - and an early warning if shares exit the channel and start deviating from their trend. One notable thing about Apple's uptrend is the fact that last week's correction was far less painful on a relative basis for Apple investors than it was for the S&P 500. Shares are testing trendline support for the fifth time since May - and we're getting confirmation of buying pressure at support with a 2% move higher. That makes today a solid opportunity to pull the trigger on an Apple buy. Risk management is still crucial for Apple bulls here; it makes sense to park a protective stop on the other side of support, such as around the $205 level. If Apple fades down to $205, the uptrend is over. Meanwhile, shares are sending a key buy signal to investors today.